Whole Body Cleanse, 3-product kit (Enzymatic Therapy) - Penn Herb Co. Ltd. 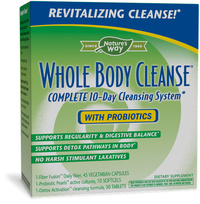 Rely on WHOLE BODY CLEANSE to rejuvenate, refortify and detoxify your body! 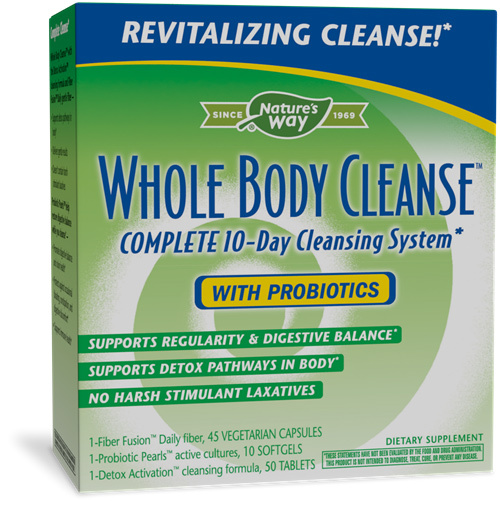 "After one dose of whole body cleanse, I felt it working the next day. No cramping, no fatigue, just the type of elimination I was looking for." - V. Estes. Why should you cleanse? Toxins are everywhere - in our air, food and water - you can't escape them. The vast amount of toxins creates a real challenge for your body's built-in detoxification system. (1) To Cleanse: Super Milk Thistle® eliminates toxins and support liver function. (2) To Detoxify: Fiber Fusion™ daily cleansing fiber binds to toxins so they don't get reabsorbed into your bloodstream. (3) To Rejuvenate: Laxative Formula is a non-stimulant laxative with a soothing herbal blend to promote healthy and comfortable bowel cleansing; gently purges the intestines of built up toxins. Supports detoxification for the whole body including the intestines, liver, gall bladder, circulatory and lymphatic systems. Includes a complete Detox Guide with additional tips on lifestyle, exercise & diet. Safe, natural and effective! See PDF Label Facts for individual product directions.